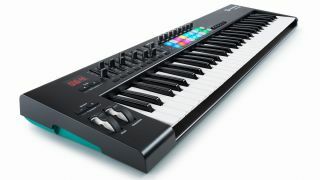 Novation's Launchkey 61 is a MIDI keyboard controller that gives you more, putting you in charge of Ableton Live with keys, faders, knobs and velocity-sensitive pads. What's more, during Black Friday season you can get it for a knockdown price. The Launchkey 61 is designed to work with Ableton Live straight away - just plug in a USB cable and off you go. You can use it to control the session view, instruments, effects and mixer, while the 16 pads are great for launching clips and playing beats. The 61-note keyboard, meanwhile, offers synth-style velocity-sensitive keys that are fast and easy to play. The Launchkey 61 ships with Ableton Live Lite, Novation Bass Station and V-Station virtual instruments, and a 4GB collection of samples from Loopmasters. It also integrates with FL Studio, Pro Tools, Reason, Cubase, Studio One, and Logic. Musician's Friend is currently offering the Launchkey 61 for $209.99, a saving of $40 on the regular price of $249.99. Make sure you don't miss out. Novation's Launchkey 61 is a MIDI controller that gives you more, putting you in charge of Ableton Live with keys, faders, knobs and velocity-sensitive pads. And during Black Friday season, you can get it for a knockdown price.